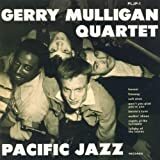 [PacifcJazz] Chet Baker (tp),Gerry Mulligan (bs),Bob Whitlock (b),Chico Hamilton (ds)　16.Aug. 15,16.Oct. 1952 LA. Carson Smith (b),Larry Bunker (ds) replace Whitlock,Hamilton　27,29,30.Apr.1953.LA.